Happy National Wine Day and Memorial Day Weekend! In honor of such a boozy occasion, I've come up with a two for one recipe...Red or White & Blue Sangria. Finalizing a menu that is a crowd-pleaser without driving the host into debt is one of the hardest tasks of party planning. Sure, you can throw a party where each person gets a customized beverage and dinner recipe, but you will probably need to take out a second mortgage. Sangria is a great party drink. The recipes lend themselves to large batches, but the question is always red or white? Why not red and white? 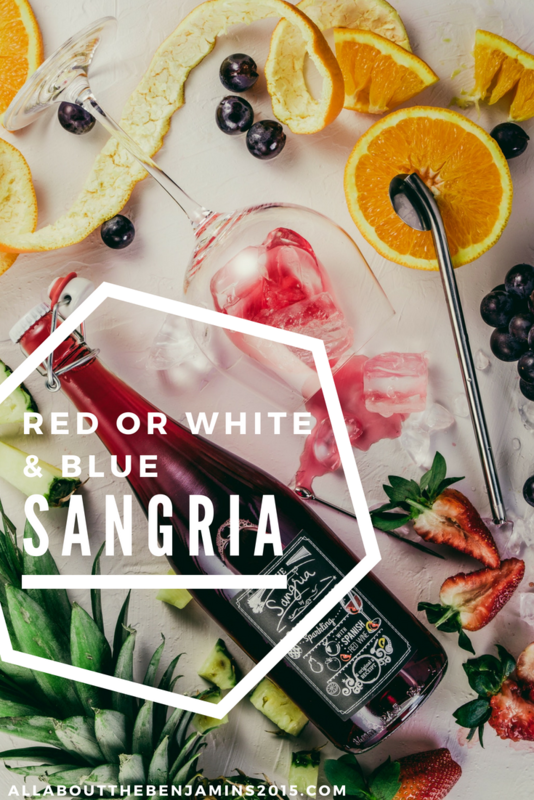 My Red or White & Blue Sangria lends itself to be made with either red or white, allowing you to use the same recipe twice and please the red wine drinkers and white wine drinkers in your life. Sorry beer drinkers, today just isn't your day 😉. Prep Time 5 min , serves 12. Place fruit into a pitcher or large beverage dispenser. Pour liquids over fruits and stir together. Let sit and marinade for several hours or overnight (refrigerated). Sever over a splace of seltzer to keep hydrated on warm days. Garnish with wine infused fruit from pitcher and additional frozen fruit to chill. Champagne Punch & Sparkling Red Wine Punch! © Abby Benjamin, All About the Benjamins 2015. Ethereal theme. Powered by Blogger.